The Homer Cycling Club is pleased to present our 7th annual Big Fat Bike Festival! 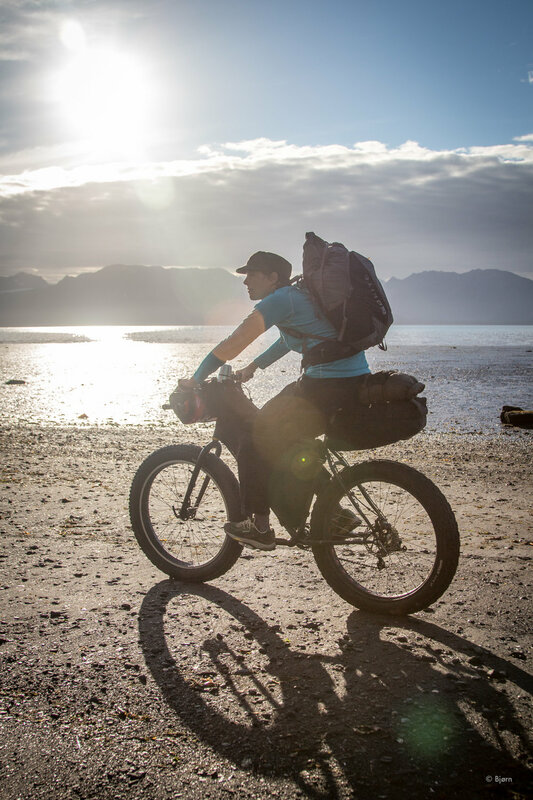 6 PM to 7:30 PM Sage Cohen presentation at the Homer Public Library, "Two Bikes, One Joy" about cycling in New Zealand and Patagonia. 6:00 PM Meet and Greet at Bishop's Beach bonfire and obstacle course. WAKE-UP Eat a hearty breakfast (on your own)! 8:15 AM Gather at Alaska Islands and Oceans Visitor Center for ride check-in and bike loading. 8:45 AM Some words from your hosts. Load buses. 9:00 AM Depart for Anchor Point Beach. 9:30 AM Unload buses and bikes, gear up and WAIT for group photo! 12:00 PM Check-out opens at Bishop's Beach pavilion. All registered riders must sign out. Light snacks and coffee/tea provided. 1:00 PM Bike Wash opens at Cycle Logical. 4:00 PM Bike Wash closes at Cycle Logical. 4:00 PM Doors open at Alice's Champagne Palace. Silent auction is on! 5:00 PM First raffle ticket drawing. 5:30 PM Second raffle ticket drawing. 6:00 PM Silent auction closes. Last raffle ticket drawing. 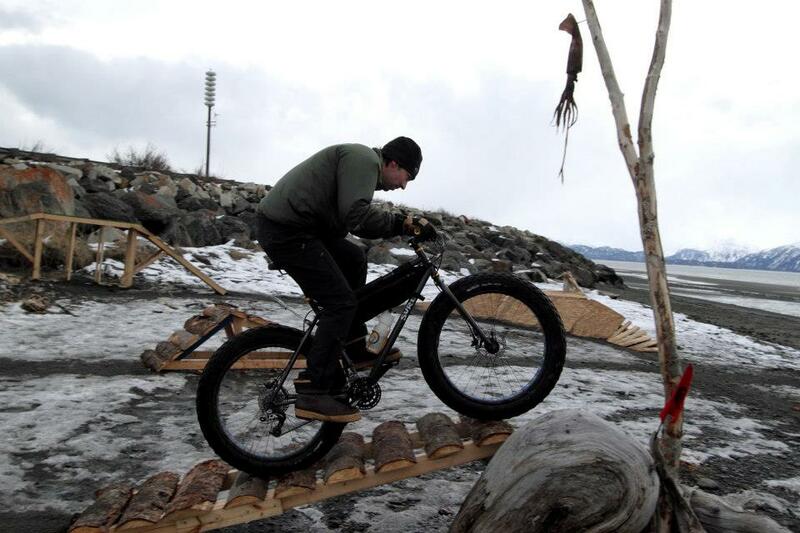 On Friday evening, March 23rd, come kick off the Big Fat Bike Festival (BFBF) with a Meet and Greet bonfire at the pavilion at Bishop's Beach. The Obstacle Course will be ready for riding so bring your bikes and do some loops! Hang out with friends and family (the furry type are welcome too), a growler of your favorite brew to share (or not! ), and/or some food to roast on the fire. The Featured Ride on Saturday morning is an Anchor Point, AK to Homer, AK one-way ride. We will gather in Homer at Alaska Islands and Oceans Visitor Center to get riders checked in, load bikes on trailers/box trucks, and load riders on buses (no dogs allowed on buses or this beach ride). The trip to Anchor Point takes about 20 minutes on the bus. We will unload at the Anchor Point Beach located at the Anchor River State Recreation Area. From there we hit the beach and head south towards Homer. This is a one-way ride so please be prepared to ride all 16 miles. The route is a mix of gravel, rock and boulders on the upper beach and smooth, fast sand flats on the lower beach. Most likely we will be riding on the upper beach (rockier than lower beach) since we start the ride just after high tide. You'll find a cozy bonfire 8 miles up the beach at Diamond Creek where you can warm up before venturing on. The rocks and boulders on the upper beach get larger the closer you get to Homer so be sure to save some energy for the last few miles. As the tide heads further out, the sand flats will become exposed, but how much exposure will depend on how fast you ride and how fast the tide heads out. 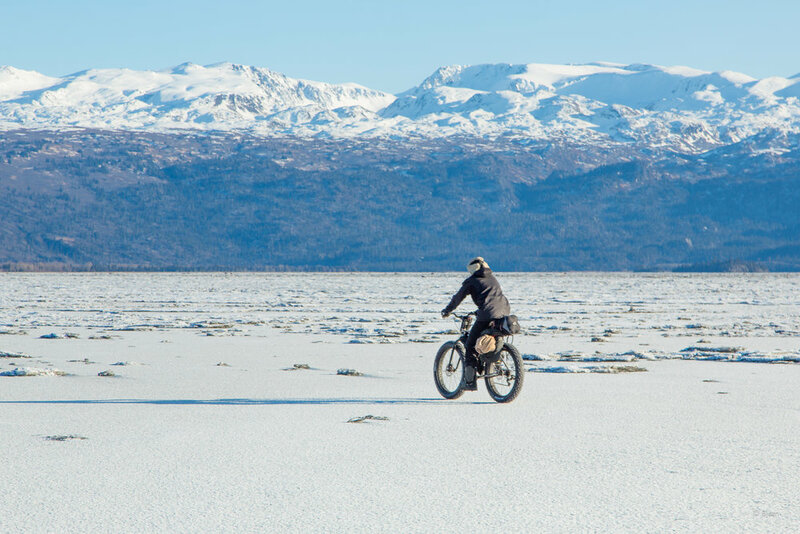 There are minor water crossings along the route that could be frozen and depending on temperature much of the beach and rocks could be covered in ice. You may want to consider using your studded tires. The ride follows the beautiful bluffs of Baycrest and the Cook Inlet. On a clear day the volcanoes of the Cook Inlet are visible. The ride is in a marine mammal protected area and many times we see sea otters and seals along the route. This is one of our favorite local rides! The ride ends at Bishop's Beach where all riders will need to sign out with the Homer Cycling Club volunteers stationed there. There will be light snacks and coffee/tea provided. It is a short distance from Bishop's Beach to Alaska Islands and Oceans Center so your car can be retrieved by walking or riding a short trail. Enjoy your hard earned meal and beer, and try your luck in the raffle at Alice's Champagne Palace (included with your registration). There will be a silent auction too, so you can bid on and win some cool stuff from our awesome supporters. This year's bike wash will be held at Cycle Logical. Bring your bike and Derek (owner and wrench at Cycle Logical) will get you lined out to wash your bike of all that salt and sand and get components dry and lubed for your next ride. Sunday we will have an additional ride on the snowy trail of the Caribou Hills, east of Homer. We will meet up at Bishop's Beach at 9:00 AM in order to carpool out to the trailhead. The drive to the trailhead will take approximately 30-40 minutes. Once at the trailhead, we will split up into smaller groups based on ability and commence riding. The ride will be on packed snow trails, with the possibility of ice. 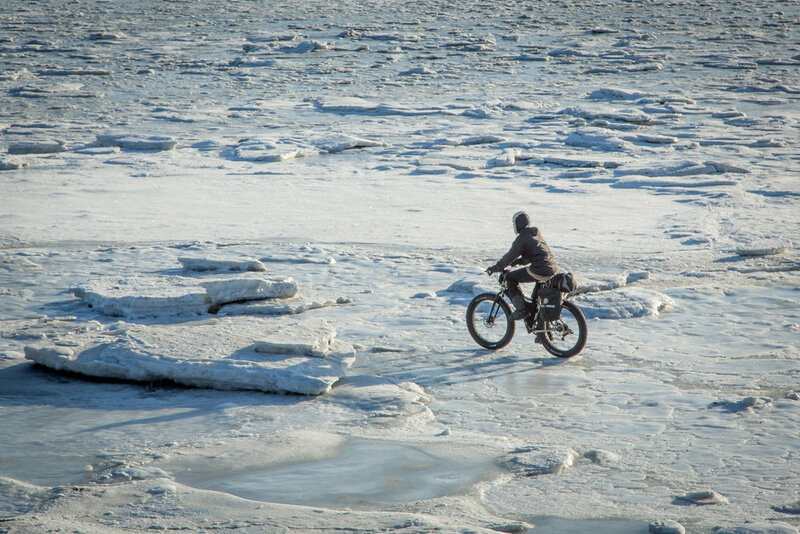 Wide, studded tires are recommended, though not required. Expect about 4 hours on the trail with a possible stop at the CCL lodge for food and beverages (make sure to bring cash). Plan on 5 hours at a minimum from departure to return. 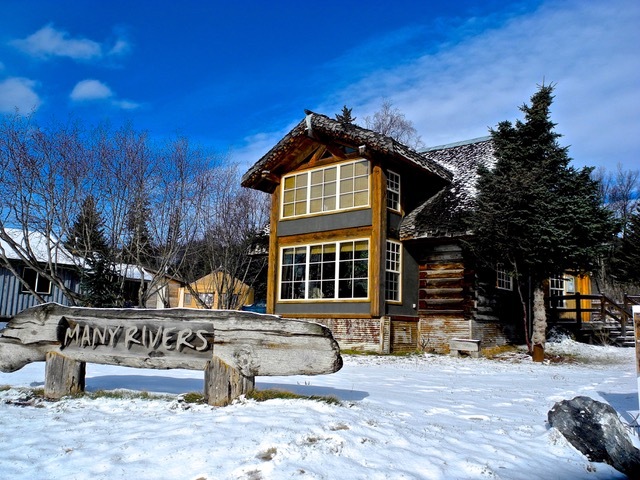 Yoga will be offered by Ramona Pearce at Many Rivers exclusively to BFBF participants. All levels. No prior yoga experience necessary. When you finish a Fat Bike ride you’re tired and your muscles ache. Most of us tend to dehydrate. Yoga serves as a quick and easy recovery tool that can be effortlessly incorporated into your post-ride routine. In this class we will open the areas that tighten during biking—specifically, the hips, legs, lower back and shoulders. At the same time, it will strengthen your core and improve flexibility, which helps to correct imbalances caused by the repetitive motion and posture of cycling. Long holds and inversions will flush lactic acid out, relieving some of the soreness in overworked leg muscles. Chest openers will release tension in the upper back and neck, encouraging deeper breathing and a more relaxed stance on the bike. Tips: Come 10 minuntes early to sign waiver, bring your own mat if you can (there will be one available to use), drink water before and after, try not to eat a big breakfast. This is a community event and we encourage public participation at the Meet-n-Greet bonfire, obstacle course and the evening fundraiser at Alice's Champagne Palace. There are many perks to registering (meal, t-shirt, yoga, and participation in the rides), but we encourage you to bring your family and friends to the open events! CAN I BRING MY DOG ON THE RIDE? Your pups are welcome on the beach during the Meet-N-Greet Bonfire and on the Sunday ride, however dogs will NOT be allowed on the featured Saturday ride. This is due to transportation (no dogs allowed on the buses) and due to the marine protected areas along our route. In the events that dogs are allowed, please be respectful to other participants, animals, and habitat regarding your dogs. These beaches are habitat to birds and marine mammals that are sensitive to the presence of dogs. Keep a verbal leash and clean up after nature calls. WILL I BE ON MY OWN OUT THERE? We encourage self-reliance. While this is a group ride experience, it is part of the Homer Cycling Club (HCC) mission to encourage independence and self-sufficiency in all cyclists. Most HCC members on the ride will have tools and the know-how to help out should you have a flat or a mechanical. Take a look at the recommended gear list above. I DON'T HAVE A FAT BIKE!!! CAN I RENT ONE? Please contact Cycle Logical, Homer Saw and Cycle, the Seward Adventure Company, or Beemuns Bike Loft for rental information. Cycle Logical and Homer Saw and Cycle are based in Homer. The Seward Adventure Company is out of Seward. Beemuns Bike Loft is in Soldotna. Try to secure yourself a bike before you register for the festival. Refer to the recommended gear list, above. WHERE IN HOMER CAN WE STAY? There are numerous lodging options in Homer...to name a few....The Beluga Lake Lodge is centrally located as well as The Heritage Hotel. Locations near the beach in Old Town Homer are Suites By the Beach(at Two Sister's Bakery) and the Driftwood Inn. There is also Land's End at the end of the Homer Spit (they have a hot tub!). Yes, but we promise not to overwhelm you with in-your-face fund raising. There will be a raffle and silent auction, possibly even door prizes! All BFBF registrants get one FREE raffle ticket. After all expenses are settled, the profits will be invested in the local area, promoting all things cycling in accordance with the Homer Cycling Club (HCC) mission. Much of this year's profit will go towards continuing our area-wide education campaign "Homer Shares the Road" and continuing development of single-track mountain biking trails at the Diamond Creek State Recreation Area.